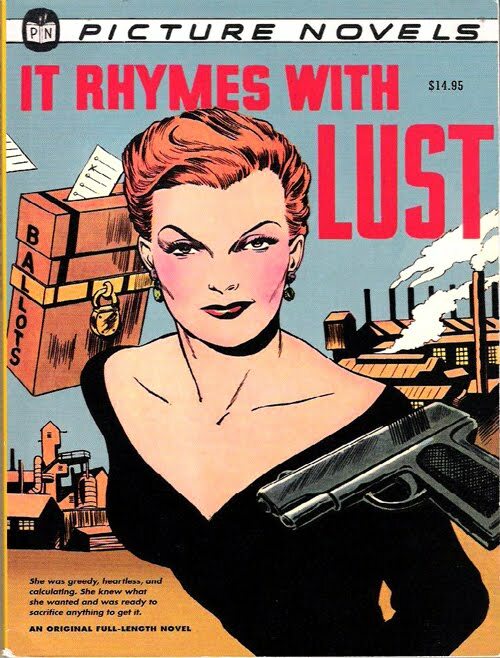 I just read the Dark Horse reprint of It Rhymes with Lust, often cited as one of the seminal books in the history of graphic novels. It was originally published in 1950 and tells the story of a power-hungry woman named Rust Masson, and her attempt to gain control of Copper City. The story was by Arnold Drake and Leslie Waller, with art by Matt Baker and Osrin. Drake's work that I'm most familiar with are his humor books, mainly from the 1960s. I've seen a few of his superhero stories, too, but they had they had the trappings and conceits of the time and publisher. That is, they were a bit corny. I only know Baker really by his reputation as an artist who excelled at drawing beautiful women. I've seen a few of his covers but that was about it. So, coming to Lust, I was expecting not far removed from the romance comics of the 1950s, perhaps with a little more sexual innuendo. I was instead pleasantly surprised by what I found. The story isn't terribly complex, but the characters are all definitely a lot more three-dimensional than what you'd typically find in those romance comics. There were some unusual characterization issues -- notably how Hal becomes soppingly obedient to Rust whenever she's in the same room, but is a strong, macho character otherwise -- but they tended to stand out because everything else was pretty solidly done. What really impressed me, though, was Baker's art. Yes, all the women are beautifully rendered, but his art was top-notch across the board. Everything he drew in there was smooth and stylish, whether it was the plucky kid delivering newspapers or the overweight robber baron or the Cadillac in the background. PLUS, the man had some strong storytelling chops! I was never once at a loss for how the action moved around the page, and it was always immediately obvious what a character was feeling just by their facial expression and body language. There was this other clever thing going that I don't recall seeing before. At least, not this specific variation on the idea. The book is in black and white, and Baker drew and inked everything normally. But then, there was a white half-tone pattern (presumably Zip-a-tone) added over top of everything except the focus of the panels. It was often used to relegate the background to the background -- not unlike a soft focus in a movie -- but it was also used anywhere where part of the scene wasn't as important, regardless of where it appeared. There were a couple places where it seemed a tad out of place, but it worked surprisingly well, I thought. I don't know that I'd go so far as to say it's a stellar read, but it was a very solid book, even compared to later works. And I have an hugely increased amount of respect for Baker. I was waffling about getting that biography of him from TwoMorrows but I am totally sold on it now.